The Gage County MAPS (Multiple Agencies Partnering for Success) Coalition is a collaboration of over 50 individuals, agencies, and organizations that work to improve the quality of life for individuals, families, and communities in Gage County. We have four Task Force committees that focus on the areas of Healthy Lifestyles, Expanded Education, Individuals Youth & Families, and Community Justice. In addition, the MAPS Coalition was awarded a federal Drug Free Communities grant from the Office of National Drug Control Policy, which allows us to work on a variety of underage drinking and substance abuse related initiatives. The Gage County MAPS (Multiple Agencies Partnering for Success) Coalition is pleased to announce that there is a new, state-wide Nebraska Underage Drinking Tip Line sponsored by the Nebraska Office of Highway Safety. Anyone can call the toll-free tip line at 1-866-MUST-B-21 to anonymously report a minor drinking alcohol or trying to purchase it. It also can be used to report adults selling or providing alcohol to those under age 21 or hosting underage parties. Christina Lyons, Director of the Gage County MAPS Coalition, is excited about the new line covering the entire state. The new hotline was created because the success of similar ones in Gage County and others parts of Nebraska, said Lyons. The Gage County MIP Hotline, in existence since April 2007, is being phased out in the upcoming months. It has been identified as a tool for law enforcement to pursue underage drinking crimes and for community members taking a stand against illegal alcohol-related activities going on in their communities. Lyons says they hope the statewide line will be used in the same way. The Gage County MIP Hotline will remain in service for a short time while the MAPS Coalition and other agencies spread the word on the new number. people to get into the habit of calling the new number since the Gage County MIP Hotline will be phased out in the next few months. Since almost everyone these days has a cell phone, take a moment and program it in to your phone, says Lyons. Its easy to remember and we never want a community member to be without it when they need it. Lyons shared that the MAPS Coalition will be distributing magnets and small information cards with the tip line imprint. Many of our law enforcement agencies also have the cards available if you stop in. A billboard replacing the Gage County MIP Hotline will be erected soon, Lyons shared. 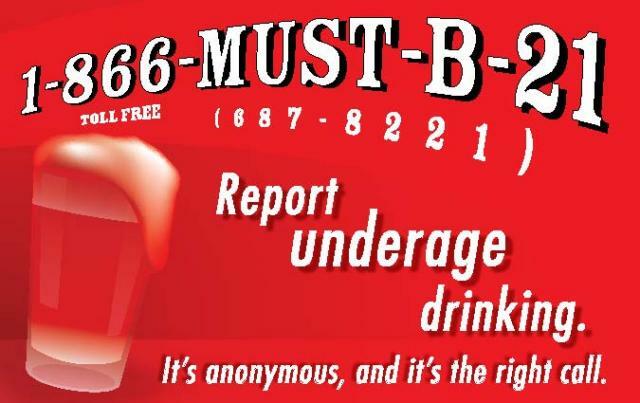 The Nebraska Office of Highway Safety, the agency responsible for creating the new 1-866-MUST-B-21 tip line, is working to curb underage drinking in Nebraska. National highway statistics show alcohol is a factor in nearly a third of all deadly crashes involving 15- to 20-year-old drivers and according to Mothers Against Drunk Driving, 5,000 people under 21 die each year due to underage drinking. Information distributed by the Nebraska Office of Highway Safety describes that it is illegal in Nebraska for anyone under age 21 to purchase, attempt to purchase, possess, or consume alcohol. It is also illegal for to sell or provide alcohol to someone under age 21 or to allow property they own or rent to be used for minors to consume alcohol. For more information on the Nebraska Office of Highway Safety MUST-B-21 tip line, you can contact their Lincoln office at 402-471-2515 or the Gage County MAPS Coalition at 402-223-1500 x 1059. Report underage drinking "As it Happens or Before it Starts." Our call is anonymous and free.